If you should know anything about me is this–I take forever to absorb a life change. I’m still trying to absorb what has happened. 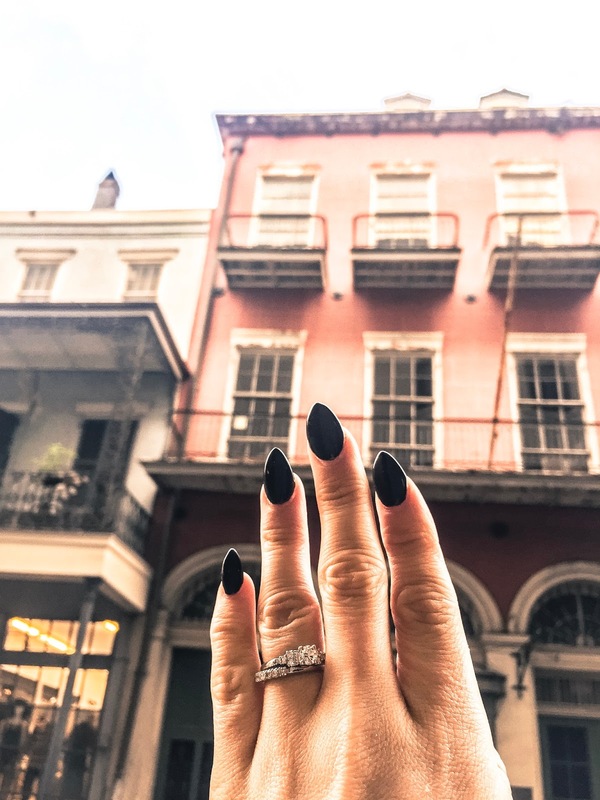 On the last day of our New Orleans adventure, my boyfriend had popped the question in a quiet corner of Muriel’s Restaurant. Through bursts of tears and onlookers, I said yes. As we walked through Bourbon Street, I couldn’t help but bask in this magical glow. I’m engaged. I’m going to be someone’s wife. How did I get here? Fast forwarding to the future, I had just turned 27 and I was struggling to find a job. Once I was laid off, I was practically partying every day to distract myself from the fact that I was under severe financial pressure. (My liver was also under pressure but that was besides the point). My daily routine consisted of sitting at my dining room table, applying for anything and everything office related. And then I’d go out and party with my friends as a distraction from adult responsibilities. Finally, I received a call for an office job not too far from my home (which was a blessing since my previous job required a 2-hour commute). Feeling like it was a sign of good things to come, I went in for the interview and was hired on the spot. Ecstatic, I celebrated and was told to start on Monday. One afternoon in the midst of eye rolls, I noticed an unfamiliar face who approached the cubicle across from me. He introduced himself as Joe, the security manager of the building. He kept to himself mostly. But during some office chit chat with our surrounding coworkers, we engaged in light conversation. Our conversations felt organic. We had a lot in common and it felt nice to be myself. I’m not one to immediately obsess over someone, but when I got home that day–I couldn’t stop thinking about him. I’m extremely clueless when it comes to figuring out if someone likes me or not. I have to have it written on a piece of paper. I can’t pick up subtle hints to save my life! Don’t judge me. For some odd reason, I needed to make a move. If I didn’t–I’d go home feeling stupid for not at least trying. Taking a chance seemed to be the only way I’d ever know if this had potential or not. Feeling brave, I wrote my number and name on a piece of paper and tossed it over the cubicle quickly. I put myself out there, and I could only hope that the feelings were mutual. Ever since I threw my digits over the cubicle, our friendship had proceeded into a relationship. Over the next month, we had been texting regularly. I had even changed his name in my phone just in case any of my coworkers decided to be nosy. (I couldn’t take any chances.) We were in a little bubble. It felt nice to have our little secret glances or quick trips to lunch. I had a reason for coming to work compared to before. I was finally happy in the festering shithole. My mood was better overall seeing as though I was practically dating my coworker. We had both agreed to keep things private until we were both out of the building and onto better jobs. For the next six months, we kept our relationship private. I reassured everyone that I was single and although several single creeps in the building couldn’t take my not so subtle hints, they continued to hit on me anyway right in front of my boyfriend. Joe would have to stand there and watch someone flirt with me but couldn’t do anything about it. If he did–it would blow our cover. It became almost a running joke between us. I found it funny although he found it frustrating. Our relationship had its challenges. Work was under the control of a misogynistic, racist dictator and it was beginning to take it’s toll on the both of us. Sometimes I’d come over and just start crying after a long day of calling businesses non-stop. I was starting to crack. Arguments ensued almost daily. I was beginning to take my work home with me. The pressure was mounting. We were under immense heat for not filling the venue to capacity. I was reaching the end of my rope. What if I started dating him? What would you say? I’d say you’re pretty desperate. You’re out of his league. We had to pull through. He would hold me and let me know that everything was going to be alright. He reassured me that we would both find something better. He said that we just had to grit our teeth and push on through. We weren’t just this forbidden romance–We were a team. I think that was the very moment I truly began to fall in love with him. He was my counterpart, my other half–my team mate. He was the only good thing that came out of that place. I wake up every morning wondering how I had gone through life without him. He’s my best friend. We live together in a townhouse. We collect horror memorabilia. We go to conventions, haunted attractions, theme parks, brunches–you name it. We do it all. I thought that my life was over ten years ago at the ripe age of 16. I thought that my moment had come and gone. But I couldn’t have been more wrong. Something cosmic was telling me that things happen for a reason and something with a larger purpose was in the works. I was meant to work in that shithole just so I could meet the love of my life. He came out of nowhere but more importantly, he showed up when I needed him the most. If you’re wondering if you’ll ever get there–you will. Stop looking. Let the universe take you there. You just might be surprised. This is a beautiful love story! Thanks for sharing! I actually super disliked my husband when I met him… he told his mother he was going to marry me, and she said "Son, she needs to like you first" … his reply, "I'll work on it" – – and we've been married 31 years! Awwww! That's wonderful! 31 years is a long time! <3 Congrats to you and your husband!